Habitat III was the 3rd UN Conference on Housing and Sustainable Urban Development to take place in Quito, Ecuador, October 17 – 20, 2016. The goal of the Habitat III conference was to reinvigorate the global commitment to sustainable urbanization and adopt a “New Urban Agenda,” which would guide the efforts of countries and cities worldwide for sustainable urbanization in the next 20 years. Habitat III was the first UN global summit after the adoption of the Sustainable Development Goals (SDGs) and the Paris Agreement on climate change. Bringing together a wide range of stakeholders from governments, civil society, and the private sector, the conference offered a unique opportunity to discuss how cities, towns, and villages can be better planned and managed to drive sustainable development, advance climate action, and improve livelihoods. At Habitat III, the World Bank led and participated in a number of sessions to share knowledge and experience in urban development, as well as to discuss what it will take to build inclusive, resilient, productive, and livable cities. Description: Cities are global and national engines of economic growth, generating more than 80% of global GDP and house more than 50% of the population. To capitalize on economic success, city decision makers need to take action now. Decisions taken by city leaders today will be long lasting and hence have the potential of building long-term success or send their cities down a path of unsustainable development. This session presented a case driven framework to foster competitive city through policies, tools, and analytics. Venue: The Urban Stage, 2nd Floor, Casa de la Cultura Ecuatoriana "Benjamin Carrion"
Description: The "New Urban Agenda" calls on multilateral development banks (MDBs) engaged in urban development to enhance coordination and partnership of their strategies, and to apply an integrated approach to sustainable urbanization and eradicating poverty. This session showcased how eight MDBs are putting these words into action by collaborating to promote equitable, sustainable, and productive urbanization and urban communities. Download biographies of participants here. Read a press release. Description: This Dialogue focused on the financing aspects of the implementation of the New Urban Agenda: how municipalities could access, leverage and manage the fiscal and financial resources need to implement the New Urban Agenda and to meet the needs of local populations. Venue: Urban Library – Casa de la Cultura Ecuatoriana "Benjamin Carrion"
Description: Co-authored by the World Bank Group and the Global Facility for Disaster Reduction and Recovery (GFDRR), the Investing in Urban Resilience: Making Cities and the Urban Poor More Resilient report looked at the both the economic and human costs to cities from natural disasters and climate change; what it will take to finance cities’ resilience to environmental, technological and socio-economic shocks and stresses; and explores the window of opportunity that has opened for governments to tap into much-needed capital. Conference participants joined us in the Exhibition Hall, October 15-20, and met World Bank Urban Specialists to explore the World Bank’s material on sustainable cities and communities. 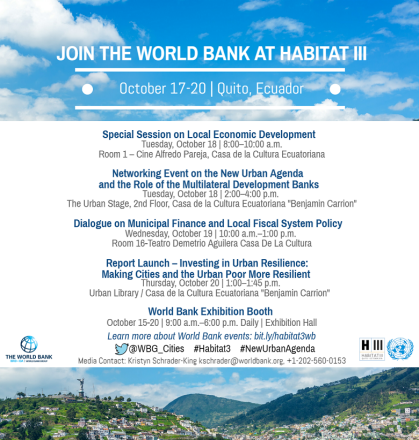 Speakers from the World Bank were also invited to participate in various other events at Habitat III.